Our goal is to provide young skaters the ability to explore their creative talents and self-expression within a community setting. 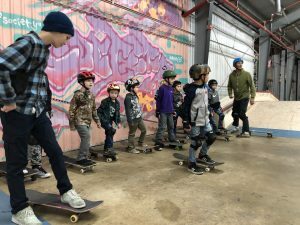 Our campers will have the opportunity to learn everything from the basics to exciting skills and grow as skaters in a safe, and nurturing environment. During camp, there will be other fun activities to keep our campers stimulated and enable social development. All of our camp staff will have had full background checks and are regular attenders of Society. Each week of camp will have a maximum of 25 spots available. higher quality experience for all. Recommended ages are 5-13 years for all gender and skill levels. We have rental equipment (skateboards, helmets and pads) but campers are encouraged to bring their own boards and pads. Drop off will begin no earlier then 8:15am. All 1/2- Day campers must be picked up by 12:45pm unless they are staying for all day camp. Full day campers can be picked up between 4pm and 5pm. Light healthy snacks (fruits, vegetable, nuts, etc.) will be provided each day of camp. We encourage drinking water instead of sports drinks. Campers will have access to all the water they need and parents can put $ on account for their kids to get food/drink from the coffee bar if they choose. Lunch will be provided to Full Day Campers every day of the week. On Friday we will have a Pizza Party for Half-Day and Full Day Campers for lunch.